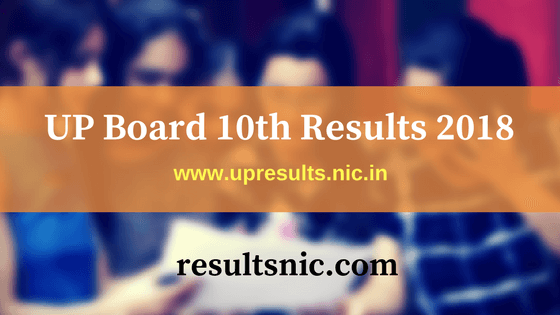 UP Board Result 2018: UP Board 10th Class results 2018 are available on upresults.nic.in after the official declaration by UPMSP. The results are out on 29th April 2018, 12:30 PM. The Uttar Pradesh Madhyamik Shiksha Parishad released the UP Board 10th class exam results on their official website. Students from Uttar Pradesh can download their results on the official website. The UP Board Class 10th and UP Board Class 12th Results 2018 will be available on official websites upmspresults.up.nic.in and upresults.nic.in. Uttar Pradesh 10th class exams were conducted from 6 February 2018 to 22 February 2018. UPMSP is in charge of conducting the 10th class and 12th class examinations in Uttar Pradesh. The UP 10th class results 2018 will be available after the official declaration. UP Deputy Chief Minister Dinesh Sharma stated that the results of Class 10 and Class 12 examinations conducted by the Uttar Pradesh Madhyamik Shiksha Parishad will be declared soon. A new academic year will start after the declaration of results and new academic year admission process. The Uttar Pradesh Madhyamic Shiksha Parishad is one of the Largest and biggest education Board of India. Every Year around 60 Lakh of Students is appeared in Secondary and Higher Secondary Examination in Uttar Pradesh. The declaration UP Board 10th Result 2018 will happen on 29th April 2018. In the Previous Year, there are registered about 35,62,682 Students appear in the 10th class examination. From this Academic year examination, the Overall result was taken as 81.18 and from out of all Girls score 86.50 percent and from Boys Score 76.75 percent. A gradual increment in the examination result of UP 10th Class Result is happening every year. So the expectation in 2018 will be more than 82 percent. The results of past five years are given below this give an idea of the performance of students and percentage of result trends in past years. The Result trend analysis is given below. The graph clearly shows a steady increase in winning percentage. So in 2018, the success percentage may be more than 82. 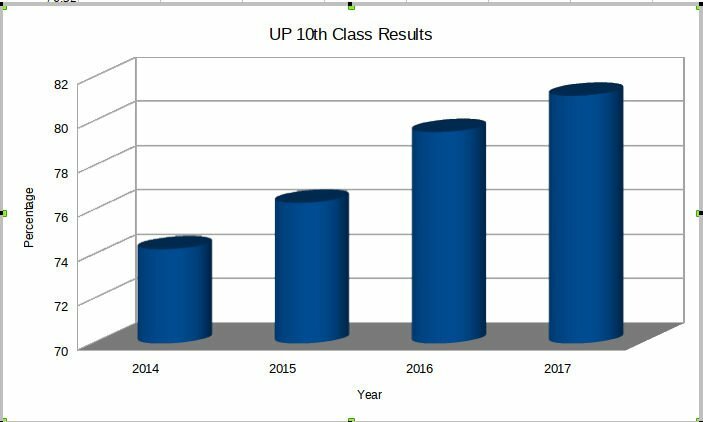 UP Board 10th Class results 2018 Analysis for past years. Steps to check the UP 10th Class Results are given below. 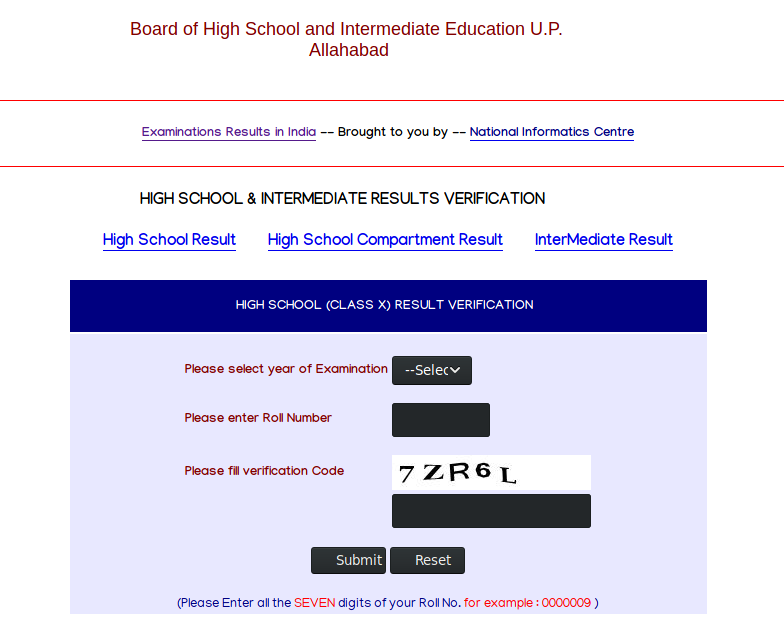 Note: The results shown on the website are for the purpose of verification of Student Data only, In case of any discrepancy Board of High School and Intermediate Education U.P., Allahabad may be contacted for clarification. Students can get the UP Board Class 10 Results 2018 and UP Board Class 12 Results 2018 on Mobile via SMS. Last year, 26,24,681 students appeared for the Intermediate examination and overall pass percentage was 81.6%. Students from UP are waiting for their 10th class results and the results are available on the website upresults.nic.in after official declaration. Thanks. I got the result now.